Zippy Junior is a full time professional magician and entertainer, and performs and may functions in Crosby. Zippy Junior has a wide range of shows available to suit all age of children. 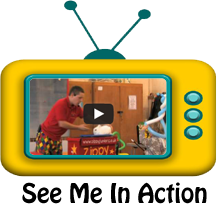 Zippy Junior’s shows are interactive with lots of audience participation, comical and educational. Zippy Junior regularly performs in local school across Crosby and the Liverpool area. You can have piece of mind that Zippy Junior is fully vetted by the police, council, and has full Public Liability Insurance. Zippy Junior’s most popular package is the 2hr stress free show, which includes a magic show with live rabbit, balloon modelling for every child, a disco with party games, dance routines and prizes. All of this is the perfect combination for a hugely successful party. Zippy Junior is one of the funniest entertainers in the Crosby area. He has many years experience, even though he is just 26 years of age, and his shows combine slapstick, magic, balloon modelling and fascinating stories which are always a huge success with the children. Zippy Junior can also offer themed party shows. Please contact Zippy for more details! At the end of every magical party, Zippy Junior provides each child with a balloon animal of their choice, along with a picture of Zippy & his magic rabbit to take away and colour in.